Centerline Ski Academy provides a unique approach to service, expertise, and instruction for those who want to experience and excel in the sport of skiing. We want to bring the same world class education and service that elite skiers receive in the quest for the elusive perfection to the skier/instructor-athlete who also wants to accomplish the same thing. 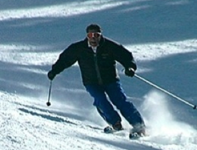 Skiing is a fun activity but it can be very challenging when there are missing links in your ability. Our goal is to identify and eliminate the weak links.